It just works. I've hardly thought about it since the day we got it up and running. "It just works. I've hardly thought about it since the day we got it up and running." Established in 1983, SD&A is a marketing and fundraising company exclusively serving the needs of non-profit organizations. Based in El Segundo, California, the company pioneered the use of the telephone to sell subscription tickets for its first client, the Berkeley Repertory Theatre, and since then has raised hundreds of millions of dollars on behalf of orchestras, theatres, museums, public broadcasting stations, advocacy groups, educational institutions and political organizations across the United States. The company prides itself on innovative thinking and strives to meet and exceed client expectations. Jefferson Berlin is involved in managing the company's data center, and he turned to Cybernetics when he wanted an innovative backup solution that would exceed his own expectations for providing reliable support for 12 Windows servers and 1 Terabyte of data. He chose the miSAN® V Series. Berlin performs differential backups daily and full system backups weekly, and prior to implementing miSAN®, his tape-only backup operation was "very unreliable with every device I tried," he says. There were "frequent tape or hardware errors," and it was "tough to get consistent backups." Berlin went straight to Cybernetics for a Disk-to-Disk-To-Tape solution that would maximize data availability while making the backup operation a more reliable, after-hours operation. With the miSAN® V-Series, Berlin was able to go from a tape-only backup solution to a smarter, more flexible tiered disk / tape solution by simply connecting the unit to his Ethernet network and assigning an IP address. Enterprise-wide access to centralized backup and restore was a matter of a few simple steps. Thanks to miSAN's® tape virtualization feature, which provides compatibility with off-the-shelf backup software, Berlin could continue using Backup Exec so there was no new software to learn. miSAN® also allowed Berlin to extend the life of his existing tape library by limiting its workload to less frequent, offline archival backup. With miSAN®, Berlin can schedule to run any time - at daily, weekly, or monthly intervals; and it supports either sequential backups or concurrent backups to independent logical libraries within the virtual tape library. Offload to archival tape is completely serverless, so there is no drain on resources, and it can be scheduled to follow the virtual tape backup automatically or at any designated time. The archived tape is non-proprietary and can be restored with any like tape drive on any like host platform. 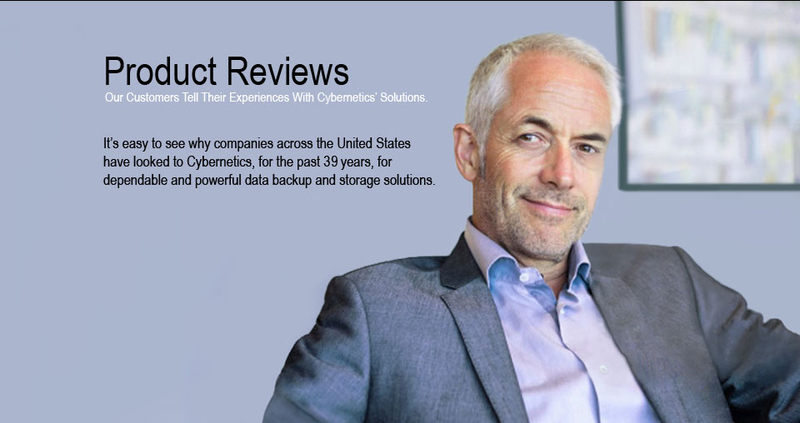 For the increasing number of customers who require extra security for removable media, Cybernetics can supply tape drives and libraries with hardware Data Encryption. The V Series is also available with an integrated Cybernetics tape drive, providing up to 4.5 TB in just 2U of rack space and up to 1.2 TB on each removable media. Other miSAN® models include the D Series, an iSCSI-based SAN storage appliance and the R Series, a multi-purpose iSCSI-based solution that can be configured as an IP SAN, a DFS NAS, an NFS mount point and D2D2T backup. "Cybernetics’ SAN solution has exceeded my expectations with its snapshot capabilities, how easy it was to integrate with my network, and more importantly, its ease of use."